ANILINE ENVIRONMENTAL has more than twenty years of experience in radiation measurements, surveys, monitoring system design, and worker training. We have developed successful X-Ray XRF PMI precision metal identification instrument operator training and permit compliance programs that are acceptable to the Ohio Department of Health. 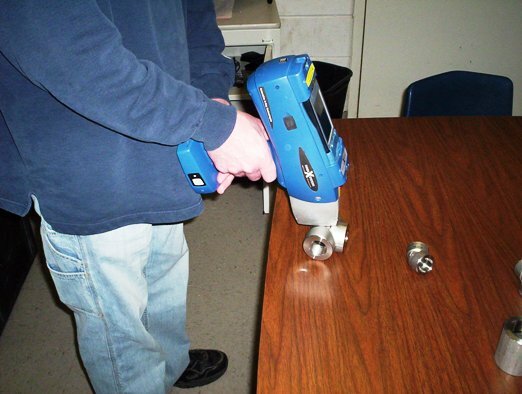 X-Ray XRF PMI are used by our clients to identify metal alloys for quality control and for lead paint identification in buildings. The X-Ray XRF instruments are also used to assure compliance with RoHS and other product compliance standards. Our operator training methodology typically results in (0) zero operator exposure to X-Ray radiation. We have experience in training operators in the safe use of Bruker, Innov-X and other brands of X-Ray XRF PMI instruments.